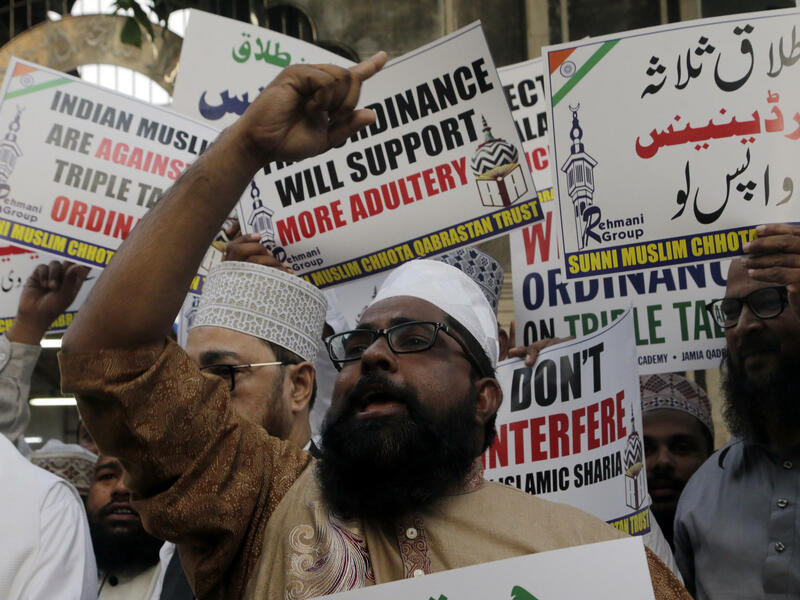 Some Muslims protested against the Indian government Wednesday after it issued an executive order to make the practice of instant divorce a punishable offence. Women's rights advocates fought to ban of the practice, and India's Supreme Court outlawed triple talaq as unconstitutional in 2017. But the drafted legislation was stymied by opposition in parliament. "We tried to reach out to Congress Party five-six times to develop consensus for passage of #TripleTalaq but they did not cooperate on this sensitive matter of women empowerment," Law and Justice Minister Ravi Shankar Prasad said in a tweet. Prasad told media on Wednesday that the government was compelled to issue an executive order because instant divorce continued in the wake of the high court ruling. Since the Supreme Court decision, the government recorded 201 triple talaq cases, Prasad said. "In a secular country like India ... gender justice was given the complete go-by," he said, according to Reuters. The new decree will allow Muslim women and their family members to come forward with complaints to police, who will "take cognizance of that offense," he said. Custody of minor children will remain with mothers and a magistrate can only grant bail to the husband after hearing from the wife. The Muslim Women Protection of Rights on Marriage Bill was introduced by Narendra Modi's government last year. Critics challenged details of the draft law, including making the offense non-bailable, Al Jazeera reported. The bill imposed a maximum prison sentence three years, The Hindu reported. It is unclear how much jail time the executive order specified. NPR's Julie McCarthy described triple talaq as a "sword hanging over a woman's head," where men could order their wives around because of the threat of instant divorce. A 2015 survey of India's Muslim community "found that 1 in every 11 women has had their marriage ended by talaq," she reported. "Of those divorced women, fewer than five percent ever gets any financial support." Zakia Soman, founder of a Mumbai-based women's rights group called Bharatiya Muslim Mahila Andolan, told Al Jazeera, "We welcome this. The Muslim woman is happy today because she wants legal protection. Despite the Supreme Court order, instant triple talaq has been taking place, so we needed this to be criminalized." Flavia Agnes, a women's rights lawyer in Mumbai, told NPR, "It's not going to make any difference to Muslim women." She said that because the measure targets the Muslim community, it plays into the country's Islamophobic rhetoric — "they use it as political propaganda that 'We have saved our Muslim sisters.' " The order also puts women "in greater danger," she says, because their husbands will be jailed, leaving them without compensation. "We had suggested the provision of attaching the property of a husband but the Modi government is not interested in giving justice to Muslim women," Congress leader Randeep Surjewala said, according to The Hindu. Sandeep Shastri, a political analyst at Jain University, told Reuters that the ordinance was a strategic move by the ruling party in preparation for general elections next year. "This 'triple talaq' ordinance basically is to try and win over a segment in the Muslim community, to win the women's vote among the minorities."